1 box (15.25 oz.) key lime or lemon cake mix (add two drops of green food coloring if using a lemon cake mix). Preheat oven to 350°F. Grease and flour a 9x13 inch oven-proof cake pan. In large bowl or electric mixer, add mashed artichokes, cake mix, eggs, oil, water and toasted coconut. Mix at low speed for one minute. Increase speed to medium-high and mix for 4 minutes until well combined. Pour cake batter into prepared pan and bake for 40 minutes or until cake springs back when gently touched in the center of the cake. Cool cake in pan for 1 hour. In a large mixing bowl, crumble cooled cake into small crumbs with your finger tips (making sure to not mash cake). Add 2 teaspoons of prepared white frosting to crumbled cake, incorporating the frosting into the cake crumbles (cake will still be in crumbs but moist). Using a 1oz. ice cream scoop, form cake balls and place on a tray lined with parchment paper (this will make 30 cake balls). Melt chocolate candy melts according to package directions. Dip cake pop sticks into the melted chocolate. Add 1 cake pop stick to each cake ball so each stick is sticking straight up in the air. Place cake ball tray in the freezer for 20 minutes to secure the cake pop sticks. Remove cake balls from freezer. Holding the cake ball stick, dip the cake ball into the melted chocolate until the ball is completely coated, allowing the excess chocolate to drip back into the melted chocolate container. 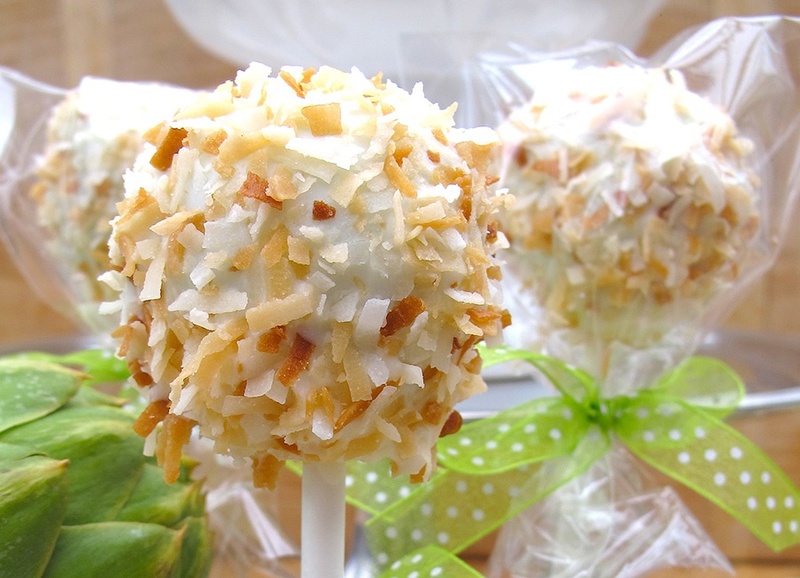 While the chocolate is still wet, sprinkle toasted coconut onto the pop. Place the dipped cake pop onto a tray lined with parchment paper (cake balls will be touching parchment with pop stick facing up in the air). Gently push the cake pop down to form a flat surface on the top of the pop (this allows the pop to sit nicely for presentation). Allow chocolate covered cake pops to harden for 1 hour or place cake pops in the freezer to quicken the hardening process. When chocolate is completely hardened, you may place cake pops in cello bags and tie with festive ribbon. Cake pops can also be displayed by sticking the pops into a styrofoam block.